People today are often afflicted with a sense that they cannot change things for the better. They feel helpless, constrained, caught – in a word, fatalistic. Beyond Fate, Margaret Visser's 2002 CBC Massey Lectures, examines why. The Geometry of Love: Space, Time, Mystery and Meaning in an Ordinary Church, takes the reader on a journey through a small church in Rome named Sant'Agnese fuori le Mura (Saint Agnes outside the Walls) Visser chose to study the intricacies, history and architecture of this church because, as she explains, "it is a building that feels as if it has been on a very long journey out of the past, has altered and suffered and gathered accretions, and now it is here with us, still bearing its cargo of memories and still carrying out the purpose for which it was built." images: the photographs chapter by chapter that go with the book! 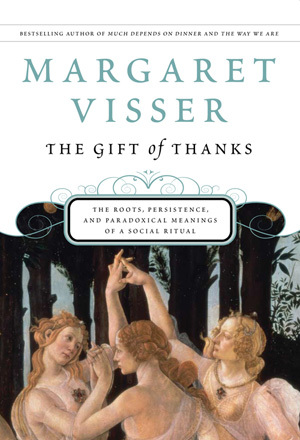 In a collection of witty and insightful essays, Margaret Visser dissects the whos, the whats, and the wherefores of the way we live. She taps into our very modern fascination with our origins, eccentricities, and foibles. What constitutes an initiation rite in our society? Why are we so squeamish about eating offal? And what are we to make of the Easter Bunny (a male rodent that produces eggs)? Winner of the International Association of Culinary Professionals Literary Food Writing Award and The Jane Grigson Award – a New York Times Notable book of the Year. Margaret Visser turns her acute eye and irresistible wit from the foods we eat to the way in which we eat them. The Rituals of Dinner explores our marvelously revealing, colourful and complex world at the table, illuminating it with examples from the ancient Greeks to modern yuppies, cannibalism and the Eucharist, formal dinners and picnics, and from the sublime to the ridiculous – depending on where you sit. Named one of the best books of the year by both The New York Times and Publishers Weekly. Winner of Britain's Glenfiddich Prize for the Food Book of the Year. Much Depends on Dinner takes us on an amazing excursion through the history and mythology of an ordinary meal. Corn, chicken, lettuce, ice cream, and other familiar foods become far from ordinary in an account that is sometimes hilarious or frightening but always enlightening and entertaining.